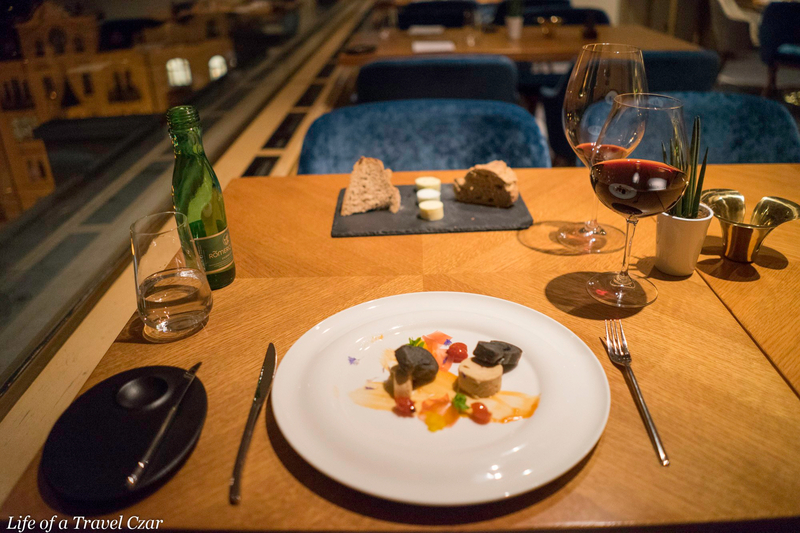 This is one of Prague’s finest restaurants which is located on the 9th floor of the Intercontinental Hotel. 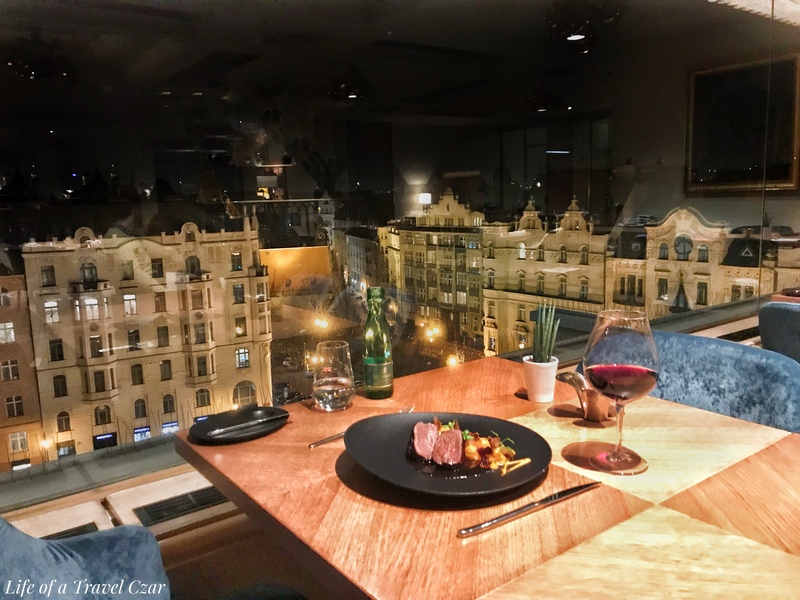 The restaurant is a fusion of Czech & international cuisine and has some pretty amazing views of the city. 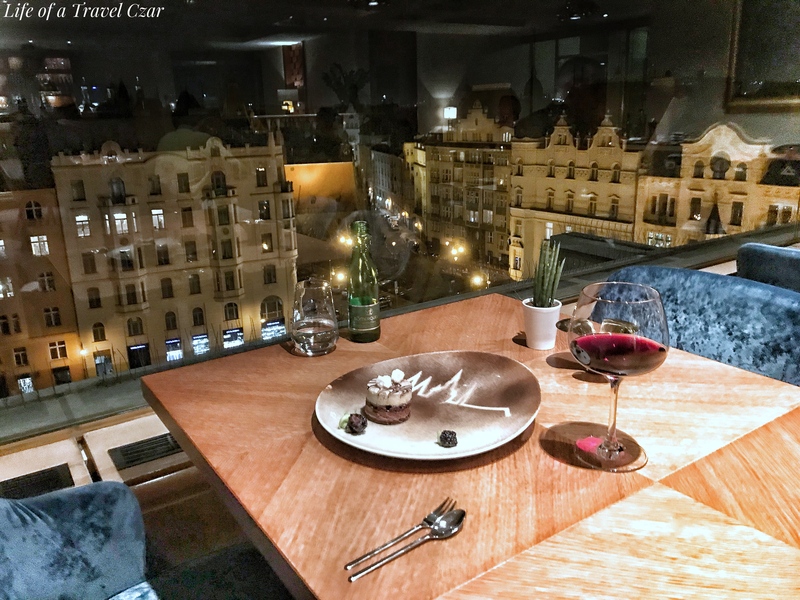 The views are something that you have to experience for yourself and this is probably the best dining vantage point in all of Prague. 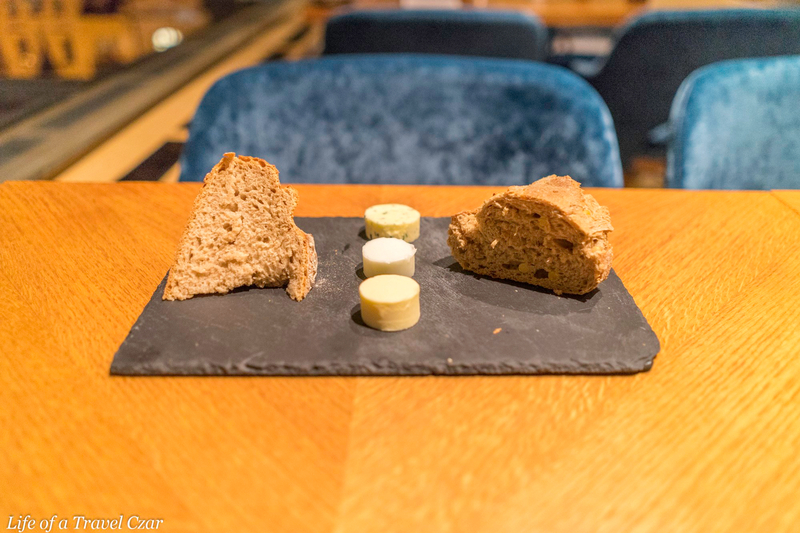 Lovely freshly baked bread and choice butters are brought out to start the dinner. There’s nothing quite like warm crusty bread and rich creamy butter to start the evening. I opt for a nice Chianti to match the dishes I have ordered today. This is a classic Chianti. In fact the vineyard and the associated castle has a great deal of history. The Castle was owned by the Verrazzano family. One of its prominent members Giovanni da Verrazzano was the navigator and discoverer of the bay of New York and of the majority of the U.S. east coast. In 1958 the Cappellini family took ownership and restored the villa and rebuilt the vineyards which produce the wines we enjoy today. This is a beautiful wine. It’s all about its fruit with good aromas of cherries and floral blossoms flowing into very strong flavours of cherries on the palate. Good tannins are resident and do well to balance the fruit intensity. The foie gras is rich and buttery with its distinct taste on full display. 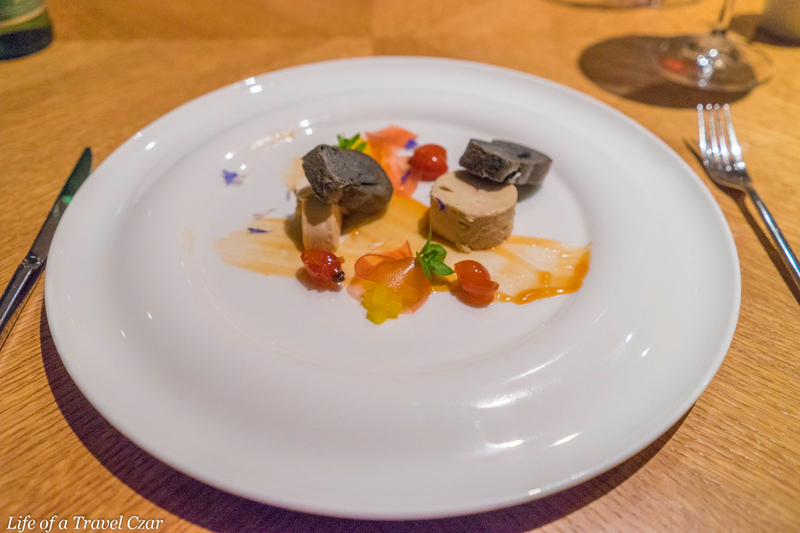 The fat of the foie gras is cut through with the sweetness of the rosehip. The charcoal brioche is buttery soft and is a good base for the foie gras. 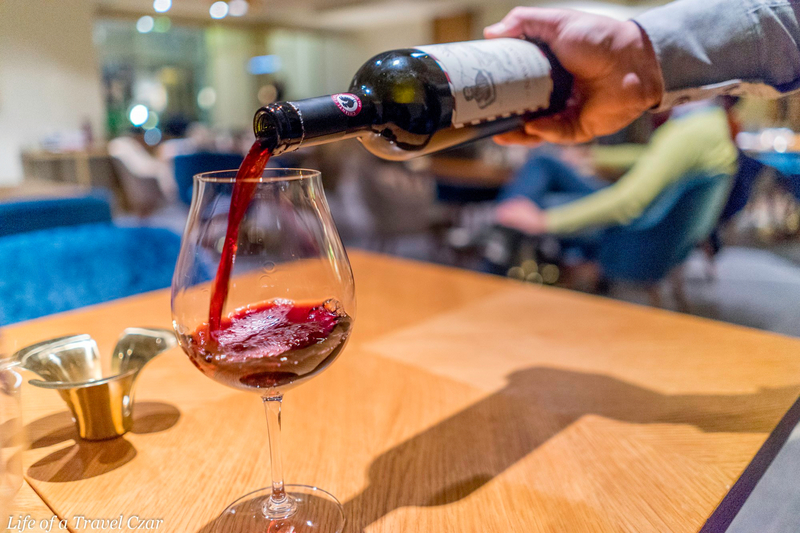 The good fruit of the Chianti does its best to cut through the richness of the foie gras and the tannins do well with the residual oils of the dish. 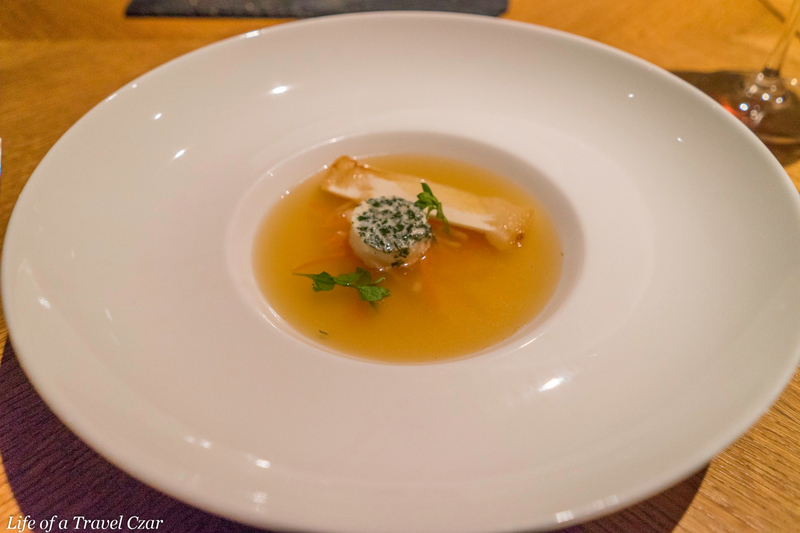 The salt and natural flavours of the hen’s broth is a perfect treat in this chilled weather. The egg soufflé is fluffy and offers a nice textural contrast to the soup as does the crunch of the melba toast. It’s a well-rounded dish which is light but satisfying. The deer is a lovely comfort dish for winter. 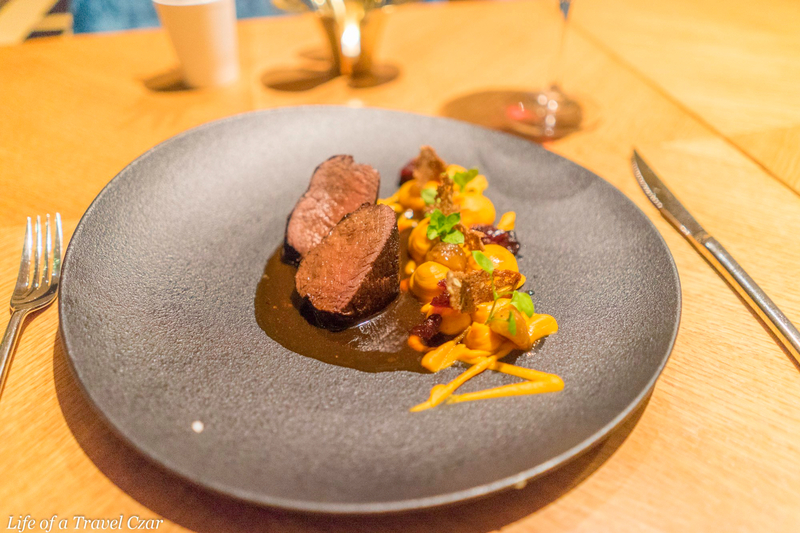 The charred outer part of the deer is in direct contrast to the rich flavoursome middle of the loin. It’s very nicely done I must say. The gamey flavours shine very strongly through the dish. The sweetness of cranberries stand-up to the deer and the chestnuts and pumpkin offer a lovely textural assiette to the dish. It’s well rounded and fires on all cylinders. I take a pause from enjoying the dish and gaze at the beauty of the wonderful city. It has a romance and charm to it. It’s retained its fine history and the architecture touches your heart in an indescribable way. Every mouthful of food and sip of wine is paired with the gaze of amazement across this city. It is truly a magical experience. I switch to a new wine for the dessert and to round-off the night. This is a richer and bolder wine. 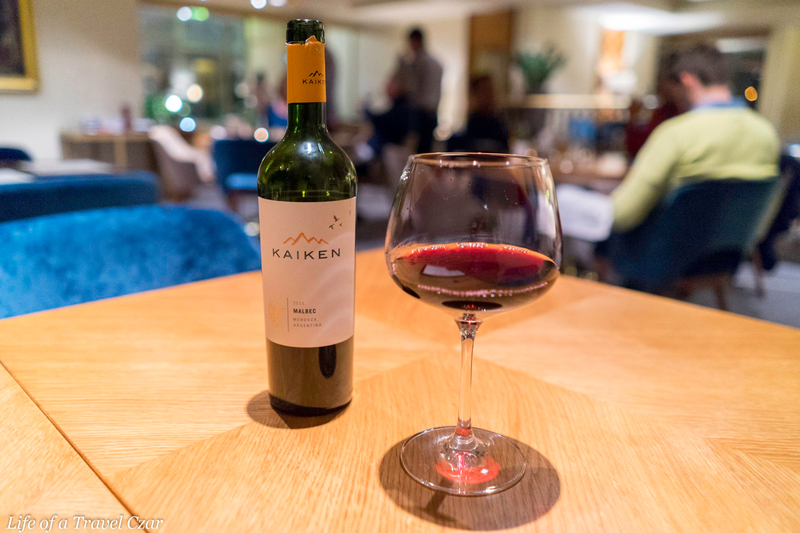 There are wonderful aromas of black fruits and a hint of light floral notes which ease you into the wine. On the palate a good full bodied hit of plums and mulberries dominate with a hint of earthiness which lingers. There are good chewy tannins with flow into the finish. The chocolate pastry is quite interesting. The dish has some nice crumbly biscuit layers, rich chocolate ganache and hints of peppermint and light cream. It’s a well rounded and it’s not too heavy which made it a lovely signature moment for the evening. I finish with a light caffeine hit to round out the day and bid farewell to the friendly staff as I brave the chill of the Prague night. This is a restaurant which delivers well with a great view. Although the interior light does reflect off the windows making it difficult for photography. The cuisine was substance over style. 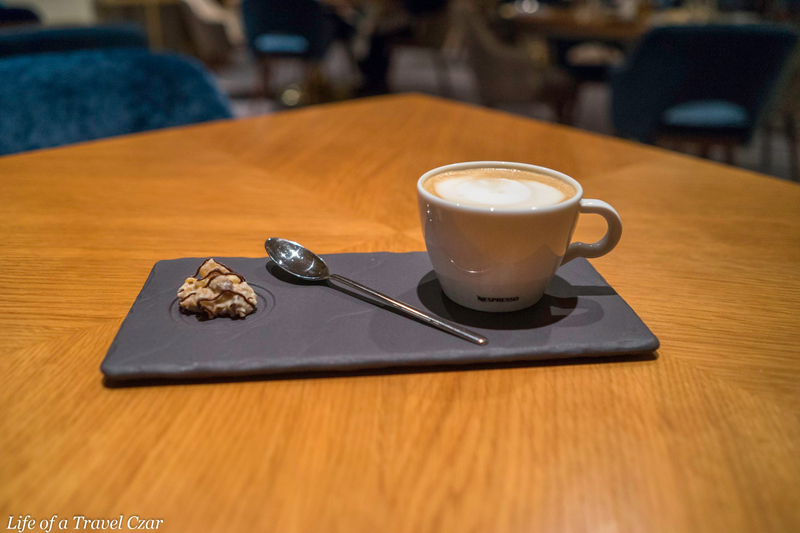 The service is more casual than I would have expected (no white table cloths and some of the fine touches were missing) but the Czech charm and hospitality was on full display. I was always attentively waited upon and was offered the chance to taste a few wines before making my choice. 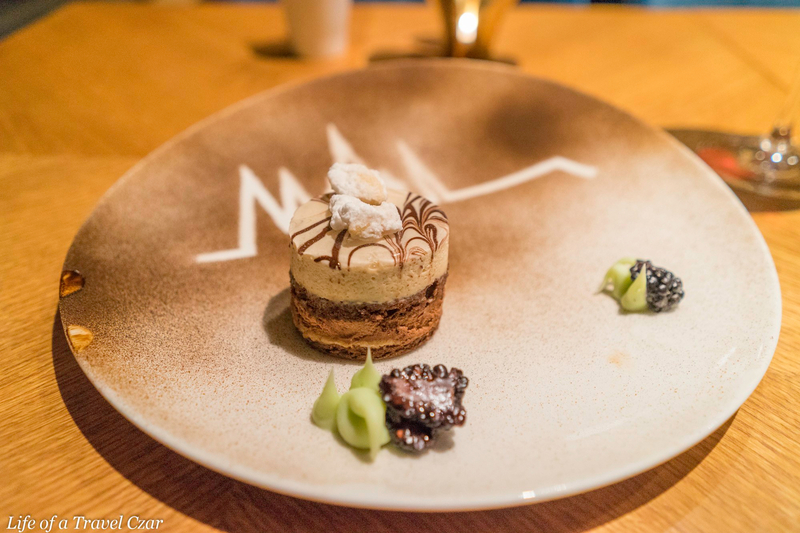 Overall a very nice experience, I couldn’t really fault the cuisine and the views were pretty terrific.